In March, the median home price for houses and condos in Spokane County was $219,000. In the city of Seattle, prices were more than $800,000 for a single-family home. Casey Bruner and CarliAnn Forthun moved to Seattle for professional opportunities. Last year, they decided it was time to leave. As the couple pondered relocation choices, they drew up a list of traits they wanted in their new hometown. The city had to support both of their careers – litigation law for Bruner, 30, and professional dance for Forthun, 29. Sunshine would be nice, the Yakima Valley natives decided. Affordable housing was a must. Bruner recently accepted a job with a Spokane law firm. Forthun has been going back and forth between Spokane and West Seattle, getting the couple’s house ready to put on the market. After they sell their 1,100-square-foot house — which Forthun bought with financial help from her family before they married — the couple plans to buy in Spokane. Bruner and Forthun figure they can afford twice the house here. In the long term, their real-estate dreams include a bit of land, similar to the acreage where Forthun grew up, with room for dogs. Spokane’s housing prices are attracting people to the area. In a recent article, Realtor.com put Spokane at the top of the list of “10 Affordable, Midsize Cities” for buyers. Chelsea McFarland, a broker for Prime Real Estate Group in Spokane, said the Realtor.com article captures what she’s seeing. Most of her clients are from out of state. “I’m not just selling houses, but Spokane in general,” said McFarland, herself a Los Angeles transplant. Her clients include young couples priced out of other West Coast markets and people nearing retirement who don’t want to deplete their savings paying for housing. They’re looking for a slower pace of life, but they also want urban attributes, McFarland said. For Spokane-area residents trying to sell a home, the influx of new residents is welcome. The new residents are often flush from selling a house in a higher-priced market, able to pay cash for the home or make a large down payment. But those sales also mean more competition in the local market. “For those of us wanting to buy, now we’re needing to spend more, too,” Valerien said. “We don’t see the Spokane market as affordable as it used to be. 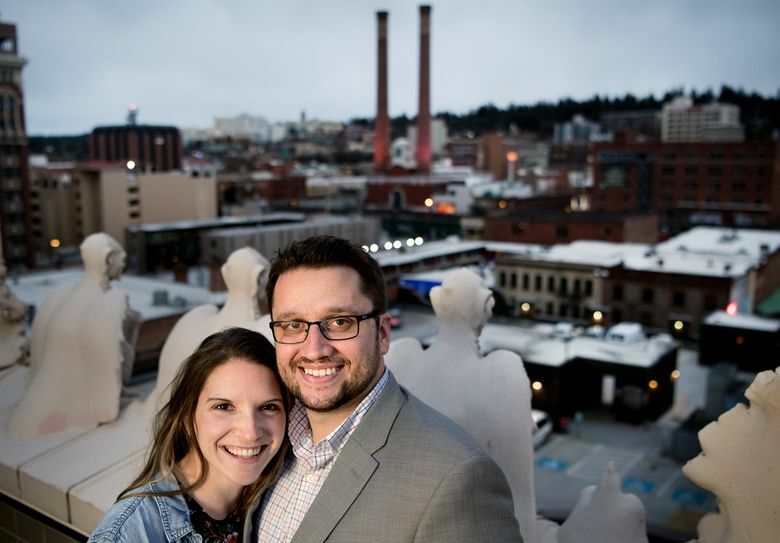 After a dozen years in Seattle, Kate and Mario Quintana, both 36, moved to a house in Spokane’s Perry District in October. Their house in Seattle’s Beacon Hill neighborhood was appreciating rapidly in value, but they were ready for a change. Kate Quintana grew up in Spokane, and living near her parents was a draw. McFarland, their real-estate agent, alerted the couple when a four-bedroom house on a roomy, 1-acre lot was listed. The couple are self-employed, which gives them flexibility on where they live. Mario shoots and edits videos for commercial clients. Kate is an illustrator and portrait artist. They paid about $370,000 for the 3,000-square-foot house. The couple get deer in their yard but live within a short walk of the Perry District’s commercial area. Amana Nova researched housing prices in Portland, Seattle and several Northern California cities before moving to Spokane in late 2016. Nova, 61, is semiretired. She found a two-bedroom house on the lower South Hill near Huckleberry’s Natural Market for $214,000. The 1930s cottage has wood floors, a fireplace and a studio, where she makes fused-glass artwork. Spokane’s natural beauty impressed Nova, but she also wanted urban experiences. A strong arts community, live concerts and yoga classes were on her list of must-haves. Nova feels at home in Spokane, where she finds people friendly and open to getting to know new residents. “It’s not snobby,” she said. “There’s not an ‘Oh, you’re from California’ ” reaction.